We control in the United Kingdom the rights in various compositions by Bobby Orlando including "Love Reaction" and "Passion". 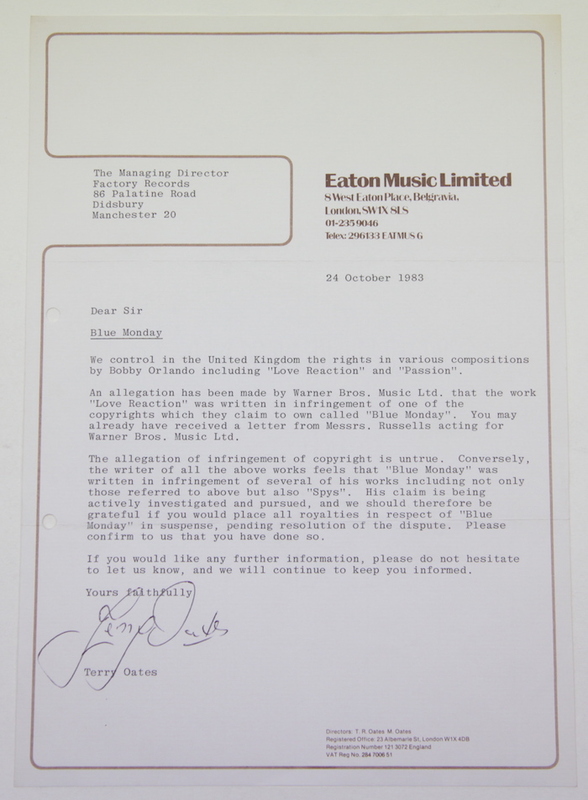 An allegation has been made by Warner Bros Music Ltd. that the work "Love Reaction" was written in infringement of one of the copyrights they claim to own called "Blue Monday". You may already have received a letter from Messrs. Russells acting for Warner Bros. Music Ltd. The allegation of infringement of copyright is untrue. Conversely, the writer of all the above works feels that "Blue Monday" was written in infringement of several of his works including not only those referred to above but also "Spys". His claim is being actively investigated and pursued, and we should therefore be grateful if you would place all royalties in respect of "Blue Monday" in suspense, pending resolution of the dispute. Please confirm to us that you have done so. If you would like any further information, please do not hesitate to let us know, and we will continue to keep you informed. Transcript of original letter to Factory Records concerning copyright issues around Blue Monday by New Order. From the AHW collection.